2. Where were armories located in Cumberland? When? Who were the commanding officers of local military units? When? Where did local military units hold maneuvers? When? The National Guard was located in a frame building, formerly the Pullman Garage, on South Centre Street in 1926, and later in a new brick armory on the above site. After World War II, a new armory was built on Brown Avenue on the West Side of Cumberland. 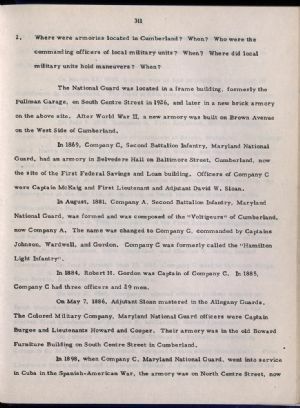 In 1869, Company C, Second Battalion Infantry, Maryland National Guard, had an armory in Belvedere Hall on Baltimore Street, Cumberland, now the site of the First Federal Savings and Loan building. Officers of Company C were Captain McKaig and First Lieutenant and Adjutant David W. Sloan. In August, 1881, Company A, Second Battalion Infantry, Maryland National Guard, was formed and was composed of the "Voltigeurs" of Cumberland, now Company A. The name was changed to Company C, commanded by Captains Johnson, Wardwell, and Gordon. Company C was formerly called the "Hamilton Light Infantry". In 1884, Robert H. Gordon was Captain of Company C. In 1885, Company C had three officers and 2 9 men. On May 7, 1886, Adjutant Sloan mustered in the Allegany Guards. The Colored Military Company, Maryland National Guard officers were Captain Burgee and Lieutenants Howard and Cooper. Their armory was in the old Boward Furniture Building on South Centre Street in Cumberland.